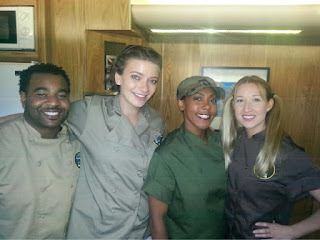 Tonight at 9pm ET/PT on Food Network is the Camp Cutthroat finale where the winner can win up to $75,000. Knowing how people usually bid on Cutthroat Kitchen, the total will probably be much lower. The winners of each heat compete for up to $75,000 and Camp Cutthroat end-of-summer bragging rights. Alton sends two chefs to rock the boat and make a trout dinner, then the opponents play “capture the cheese.” For the final challenge, it's a dessert battle with a tight squeeze and the winner takes it all. I will update this post with the winner after the episode airs and let you know how much the winner ended up taking home. UPDATE - Demarco Ellis was the first eliminated, followed by Monterey Salka. After the final challenge, Jessica Entzel was crowned the winner of the first Camp Cutthroat and took home $18,500 in addition to her winnings from her first win ($27,200 total).